The National Museum of Bosnia and Herzegovina in Sarajevo is the oldest museum type institution in Bosnia and Herzegovina. It was established during Austro-Hungarian rule, on 1 February 1888. Originally located in the downtown – at the Crkveni trg (today Fra Grga Martića trg/Square), it remained there until the order from 1906 for the development of a museum project that had been planned at the then periphery of Sarajevo. The project designed by Karlo Paržik foresaw the construction of four pavilions with a botanical garden in the central part, and the construction of a building in a neo-Renaissance style began in 1908. It is interesting that this is the only museum building in Southeast Europe specifically built for this purpose. In the course of its one hundred and thirty years the National Museum of Bosnia and Herzegovina in Sarajevo worked on the collecting, preserving and presentation of the cultural and natural heritage of Bosnia and Herzegovina. The exhibits are classified by departments (Archaeological, Ethnological, Department of Natural Sciences and Conservation and Restoration Department) in several different collections (folklore, numismatic, naturalistic, prehistoric, Antiquity and others). 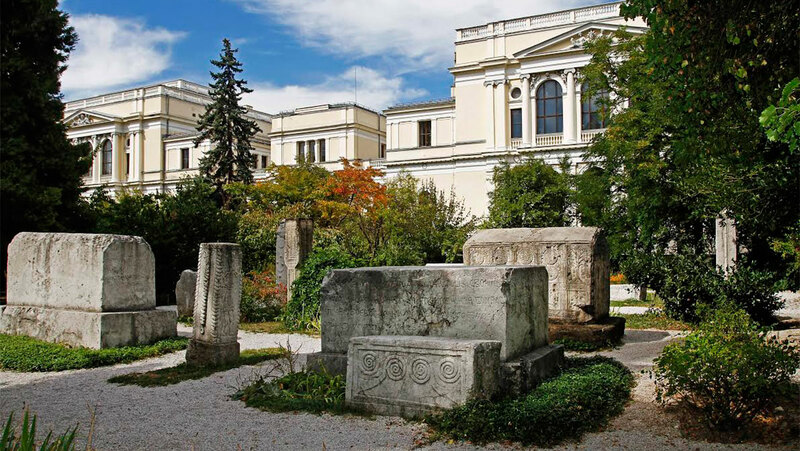 In the National Museum of Bosnia and Herzegovina, one can see the Bosnian stećaks (Bosnian medieval tombstones) that adorn the space in front of the Museum and Botanical Garden entrance, objects from the Bosnian Royal Dynasty Kotromanić Courts, the famous Sarajevo Haggadah, and about three million other exhibits that testify to the rich cultural and natural heritage of BiH.